California is the place for everything classy. 1960s Hollywood films, pinot noir vineyards, and of course classic cars. The romance wouldn’t be complete if we didn’t include a 1940 Ford Deluxe Convertible in the picture. Would it? The relationship California has with classics has been going on for over a century. They have become not only a part of the landscape but a part of the culture, too. Californians say that their state is the only place in the world where cars are vital for living. And we don’t mean it only in terms of transportation. Cars are an essential component of people’s personalities, image, and self-respect. There is no other state in the world where you will hear “I want my car to say something about my style”. With the modern auto industry relying on mass production, one can’t find a car that matches their personality anymore. This is why more and more Californians turn to classics. Twenty years ago, classics lovers were a rather small group. Particularly small in Orange County. People looked at classic car lovers strangely as the latter were gathering to examine the rusty piles of steel in their backyards. The gearheads would engage in vivid discussions about topics such as the engines of the 1970s Cadillac series or the windshields of a 1946 Ford. They indulged in exchanging vintage parts, going to classics museums, organizing antique auto shows. They were focused on bringing back the cars everyone else wanted to trade in for new automobiles. While this might have seemed strange a few decades ago, today it is the common Californian reality. Even millennials are entering the classics market. With the depreciation of classic cars’ value in the past years, it has become easier for people to join the community. Contrary to the belief that the generation Y are not fans of car ownership, the number of millennials buying classics has been increasing. Maybe it’s because classic vehicles remind them of the simplicity of their childhood. Or it’s because classics serve as a passion to focus their attention on. Or maybe they want to invest in something beautiful to show on Instagram. Snap a photo if you see one down the coast lanes. More and more people go to California just to join the community of classics lovers. You can see classic car lovers in their beauties down the city lanes of Sacramento, along the beach roads of San Francisco, and even on the state highways. But before you get your classic to California, you need to be cautious about how you transport it. You have two main options for transporting your classic through California or across the states. Open auto transport is the standard method of shipping a vehicle and it is widely used for all makes and models. Yet, when you transport a classic you might want to choose an enclosed carrier. One main downside of the open carrier is that it can expose your car to weather and road hazards. Enclosed auto transport is usually the preferred option for classic automobiles. The biggest benefit of enclosed trailers is protection. They are fully covered, similar to a cargo trailer. The higher level of protection comes not only from the features of the trailers but also from the experience of the drivers. They have more experience in handling high-end and classic automobiles. 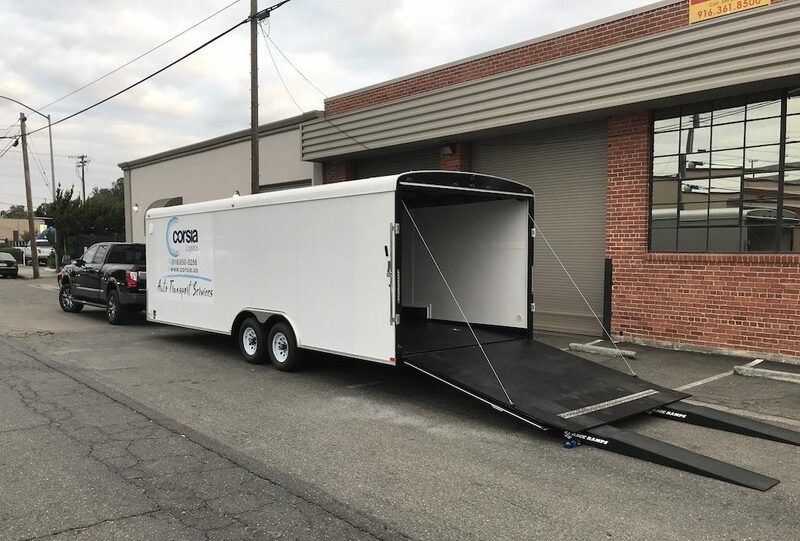 Covered auto transport carriers split into three main types of trailers: single level multi-car trailers, single-level single-car trailers, and multi-level multi-car trailers. While they offer a different type of efficiency and cost, they all fully protect your vehicle. With a multi-car carrier, your pick-up and drop-off dates may be a bit harder to schedule. You have to give us a timeframe when you are available and the carrier will arrive within that window. Keep in mind that the driver has to pick up other vehicles as well. So if another customer causes a delay along the way, that may reflect on the delivery time. With a single-car enclosed carrier, all the attention and care is reserved for your vehicle! The driver will only work with you. Corsia Logistics has its own enclosed, single car carrier serving California. It is 24ft-long single-level, single-car trailer. This makes it preferable for transportation of highly valued vehicles which need the highest level of protection. Request your shipping quote online or call. There comes a time when you want to show your classic to more people than simply your family and friends. You have probably put an effort in restoring it, invested resources in maintaining it, and it holds a large part of your heart. And now you want others to see what a masterpiece you have. This is the moment when you start browsing through shows in the region… And there are plenty in California! It’s important to find the right place to showcase your classic vehicle. You don’t want to disappoint the classics community after all! If you are a proud owner of a classic car and you want to take part in a car show, make sure you prepare well. Shipping a classic to a show can be a challenge – both for you and for the transporter. It requires extra care at every stage of the process. After all, you need the car to arrive in perfect condition so that you can show it to the public. This is why you have to choose a partner who provides white-glove auto transport service your classic vehicle deserves. A company that shares your passion for classic cars and knows how to take care of them. Keep in mind that smaller companies are more open to creating a custom solution for you. They are willing to create a service from scratch based on the specific need of a customer. They are more flexible due to their simple structures. Small companies can give you their full attention and will provide you with the highest level of customer service throughout the whole process. If you want to take it one step further and show your classic at a museum, check out the list below. Sometimes you will see collectors donating their full collections to such museums. Even if you want to keep your classic to yourself, make sure you visit them! Peterson Museum is one of the largest automobile museums in the world. The third floor is where you need to be. This is where you will find everything about So Cal’s car history. You will find a 1956 Jaguar XKSS formerly owned by Steve McQueen and the 1964 Aston Martin DB5 from the James Bond film “Skyfall”. The Nethercutt Collection features over 250 American and European automobiles dating from 1898 to 1997. Unique to automobile museums, each car on display is serviced to maintain its original, drivable showroom condition. You can find winners of the Pebble Beach Concours d’Elegance, vehicles once owned by movie stars, royalty and other cars that literally changed the world. Automobile Driving Museum is probably the only museum in the world that lets you take a ride in its classic cars! On their “Ridealong Sunday,” they take you out for a cruise around the neighborhood in any of three cars they’ve selected from their fleet. If weather allows it, you can spend your Sunday in a Camaro or a Jaguar. Fingers crossed! George Barris Showroom is the home of the “King of Kustomizer”. George Barris is known for his custom car company, where he designed and built some of the most iconic cars in TV history. Including the Batmobile from the 1960s Batman series! You can see it on display there. He has also customized cars for celebrities like Elvis, Dean Martin, and “his and hers” Ford Mustang convertibles for Sonny and Cher. You’ll be surprised at the number of classics museums and collections that you can find in California! As the community around automobile collecting is expanding, you are more likely to meet new friends and even celebrities! The Hollywood stars you see on the big screen are some of the biggest classics fans. Don’t be surprised if you see one of the people listed below at the next classics show. Yet, you don’t have to be a celebrity to make an impact with your auto knowledge. Rumor has it that Californians are the most influential auto consumers in the world. So in case you are already a classics fan living in the Golden State, you definitely have it in you. Maybe it’s time you start a blog and spread the vibe! Make California’s love for classics eternal! Most classic car lovers find entertainment in the collecting process. Similarly to numismatics and philately, the collection of classics can be considered a science. People who are fond of classic vehicles usually know everything about them – from the make and model to the components of the engine and the type of leather on the seats. They can tell you about each year’s edition and how it is different from the one before. A passionate nerd would never even think of putting a 1947 bumper on a 1946 car. They know the difference. That’s why classics collectors are huge knowledge hubs. Sometimes they know more about an automobile brand and its history than the brand’s current employees. It’s surprising that automobile brands have not taken advantage of classics fans yet. They would probably make the most loyal and knowledgeable employees a company could have. There are times when people don’t perceive classics into a full-time hobby. Instead, they see classics as an investment. They buy them for their material value. For these type of classic car owner, their vehicle serves as protection from uncertain times, as a hedge against inflation. They would usually do tons of research in advance and only pick those models that have the highest value. These collectors think of each part in a classic in financial terms. How much it costs now and how they can increase the value in time. They know that if they keep the car in good shape, its value will appreciate in the years to come. The nostalgic collector always has one eye in the past. His love for classics comes from memories of something that happened in the past. This is why his love typically focuses on only one model. Whether this was his first toy car, the one his father passed down on him, or the prom night car, it carries emotions. It reminds him of a special event or occasion that he can’t break away from. These type of people often keep a classic car for someone else. Nostalgia often comes with a dose of romance, after all. Like this one guy who bought a classic just like the one he and his wife drove on their honeymoon. After a secret restoration, he surprised his wife and invited her for a second honeymoon. Any guesses on the most romantic model? It is predicted that these types of people will become more and the interest in classics will increase. As more and more people look for small and efficient cars for their daily transportation, the market for big cars will start shrinking. Yet, the American craves big cars. This is something we can’t escape from. Thus, there will be a growing need for a big, heavy car that they can drive once in a while. Classics seem to be the answer to this need. The classic car provides its owner with a feeling of pride on special occasions. And the Golden State has plenty of special occasions! Keep it rolling, California!